In order to learn guitar fast, students must complete a 2 part process. The first part is understanding fundamental music theory concepts and the second part is practicing those concepts on the instrument. You will not learn the guitar fast if you ignore either of these principles. They both need to be functioning at the same time. Music theory is essential. I am going to say that again, music theory is essential. Many guitar players will tell you otherwise. Let’s just say this, music theory enables us to create. It is a force that has already existed that we can reshape and reform to create our own music. Theory is the building blocks that create music. We would be very wise to learn how it all works. I know that for most it is a daunting task to learn music theory. Start simple. For example, learn the relationship between keys and chords. The FretDeck teaches this and will help you to have a basic understanding of theory. This will help you learn guitar fast. Learn guitar fast with music theory! How are you going to practice music theory on the guitar? Let’s take scales for example. Understanding how a scale functions & the placement on the fretboard is critical. Let’s take the key of C Major for example. In order for us to understand how to play “in the key of c”, we need to understand where to place our scale. The FretDeck goes into more detail about this. So in order for us to place a C major pentatonic scale on the fretboard, we need to know which fret this scale starts on. (C major pentatonic scale is played on the 8th fret) This is just one of many examples of how to use the music theory you learn and put it on the fretboard. This new chord progression made the chords sound a little more Blues/Jazz. This new chord progression sounds great over pentatonic scales. So, understanding fundamental music theory concepts coupled with Practicing those concepts will help students learn guitar fast! 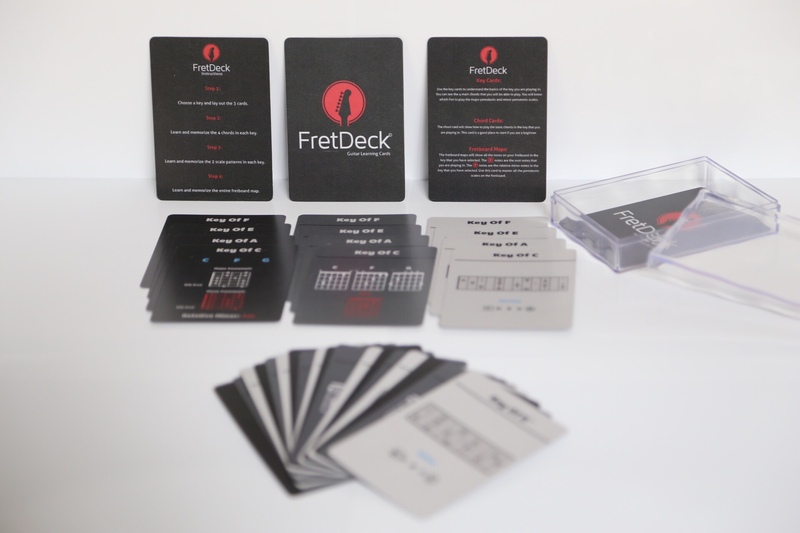 The FretDeck helps students learn guitar fast.